The Irish premier has made a symbolic visit to the headquarters of one of Northern Ireland’s Protestant loyal orders. Taoiseach Leo Varadkar was welcomed to the Apprentice Boys of Derry museum by the general secretary of the organisation, William Moore. Mr Moore made it clear to the Taoiseach that he would be welcome to return to Londonderry to watch one of the organisation’s parades as he presented him with a book about the siege of Derry and a tie. The Apprentice Boys have two main parades each year, marking the 1689 siege of Londonderry when the city resisted an attack by the Catholic King James. Mr Varadkar impressed his hosts by translating the Latin of its motto. “Life, truth and victory,” Mr Varadkar said with a smile, adding he had never studied the historic language. Mr Moore quipped back: “That’s very good, I really don’t have to teach you too much”. Mr Varadkar also received a tour of the museum and met the governor of the Apprentice Boys, Graeme Stenhouse, and DUP politician Lord Hay, a former speaker of the Northern Ireland Assembly. The outreach initiative comes months after Mr Varadkar visited the HQ of the Orange Order in Belfast. He is the first Taoiseach to have done so. Mr Varadkar then crossed the city to visit the Rath Mor Centre in the nationalist Creggan area where he met a number of local groups. 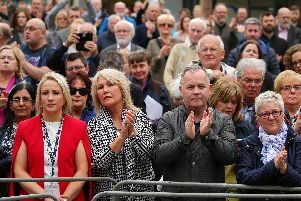 He was greeted at the entrance to the centre by a number of protesters holding banners calling for the abolition of the Special Criminal Court in Dublin. However he received a warmer welcome inside the centre where a choir sang as he chatted to a number of local people before going in to meetings with community groups. Mr Varadkar will round off his trip to the north west by speaking at a dinner in honour of former SDLP leader Mark Durkan. Speaking ahead of his visit, Mr Varadkar said he was looking forward to returning to Derry. “Today’s visit gives me the opportunity to meet with members of the wider community and to hear directly from them about their views on the political situation in Northern Ireland and of course the uncertainty being caused by Brexit,” he said. “West Ulster - the North West region has significant growth potential and the Irish Government is committed to the cross border initiatives under way which aim to boost development in the region.